How very human it is for the Son of God to fall—not just once, but twice. Twice, Jesus falls, brought down by the weight of His cross, His pain and suffering. And if Jesus can be brought so literally low, if God can allow Godself in the person of Jesus to be brought down, to suffer, then perhaps we ought to reexamine our own views on suffering, pain, and hardship. “But I would never think that way—about others or myself!” you may be thinking. It’s an insidious practice of self-hatred; our entire theology of redemption through the Christ event is centered on the need for a humanity that deserved to suffer because of its actions and, essentially, got lucky that the God of Israel happened to like humans and wanted some company and felt like grace was a good idea. So even when we don’t think we think like this, we do—about something. And justify it with religion more often than not. I for one don’t think suffering is good or bad. I think trying to assign a moral weight to suffering and pain is destined for disaster. Call it good and you glorify the suffering of people who do not deserve it, abandoning them to their suffering without trying to do our Christian duty of spreading agape love in the world in the inbreaking of the kingdom of God. Naming suffering an outright bad is just as dicey; condemning suffering leads to heresy almost any way you slice it. And on the more human level, condemning suffering as a moral evil leaves us unprepared to handle the trials and travails of human life. Instead, I meditate on the suffering of Jesus and try to cultivate compassion rather than trying to theologically justify it or glorifying it. I mediate on Jesus falling twice—showing Himself to be so very human and so far from perfect and God-like—and find peace within myself as I navigate my own sufferings and hardships as I live a very human life, graced with the Holy Spirit and love of God, given hope through the life of Christ. Have you ever thought about the wound on Jesus’ side? The “fifth wound” of Christ? 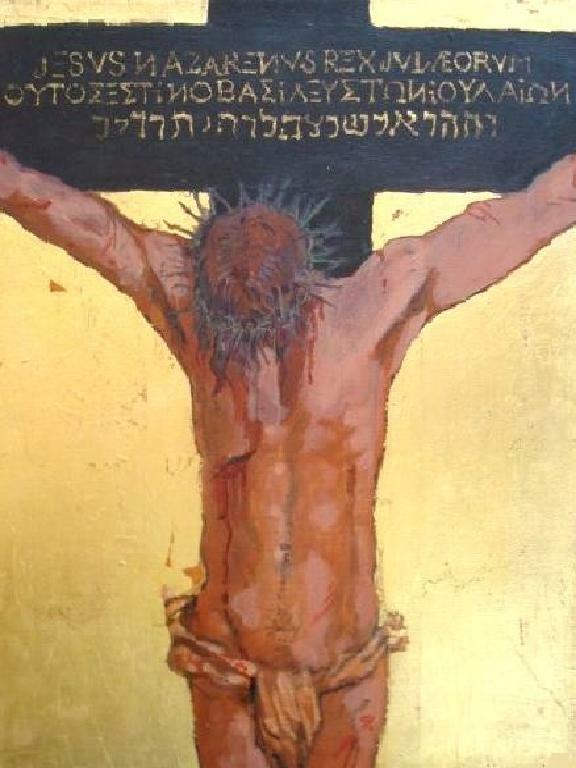 We see it here, on James Middleton’s stunning image, as we come to the station “Jesus Dies on the Cross.” On Jesus’ right side, between a couple ribs, the wound pours blood, dripping down Jesus’ body. What do you think about this wound? I’ve recently spent quite a lot of time thinking about it. 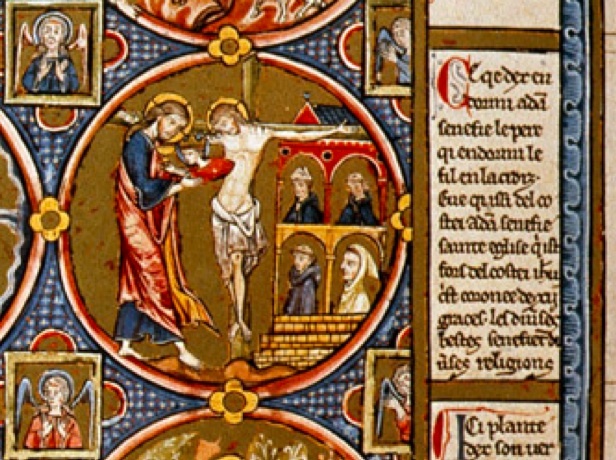 I just finished writing my M.Div thesis about how this wound has been depicted in Medieval Art and how it can help us think about Eucharist in new ways. In it, we see Jesus on the cross. Out of the wound on his side, comes Ecclesia, or “the church.” She is a young woman, wearing a crown, and in her hands she holds out a chalice and delivers it into the hands of God the Father. Here, the wound is actually a birthplace. The wound makes Jesus’ capable of bearing a child, and the child he bears is the church in which we worship. The blood of this wound is actually the child-bearing blood which we drink at communion. This Holy Week, I have been thinking about what it could mean for us to think of the blood in the chalice as this life-giving, mothering blood. On this day when we go without the mystery of celebrating Holy Eucharist, as we mourn Jesus on the cross, I am taking the time and space to imagine how the thanks I give on Easter can reflect Jesus’ gift to us, the gift of life. soup supper in the parish hall. nailing Jesus to a dirty tree, rough with bark and wilting leaves. Passion in a new way. Sometimes it causes me to tremble. new thing. This spiritual draws out tenderness and pain. even when we tremble. Amen. Jesus dies on the Cross. It is done. It is finished. This sounds and feels so final… but it is not. Thy will be done on Earth as in Heaven… this is precisely what makes it not final as it used to be because Jesus defeated death on the third day. “Abba why have you forsaken me?” Jesus cried out. We hear him in the depth of our souls for all the times we feel and had felt forsaken, abandoned, forgotten, betrayed and laughed at. Nevertheless, our desolation is not final either; we know so because Jesus has gone before us. Our outcry shall pass too. We take great comfort in knowing that our Lord understands our suffering as he has taken up on the cross the suffering and sins of the world so we can all be redeemed by his love, death and resurrection. In this station, Jesus has just died. We are overcome by grief. Our hearts and souls ache beyond any understanding. Our friend has been taken away from us. We are lost. The deserts of our souls and the dark pits of our hearts exhume all of our pains, both old and new. How could they do this to us? How can they take our Lord away from us? This is it. This is the end… The end of Calvary at the top of Golgotha. We feel defeated, stunned, bereaved and aggrieved. How long will it last? How long can we take it? We silently ask. We know our Lord understands us. He has gone there before us and that is what makes it possible for us to journey over and over again through our own Calvaries. Deep inside we know we are not alone, and that on the third day, night, week, month, decade or millennium we will be raised up by our Lord, Jesus Christ who in this station is dying on the Cross. 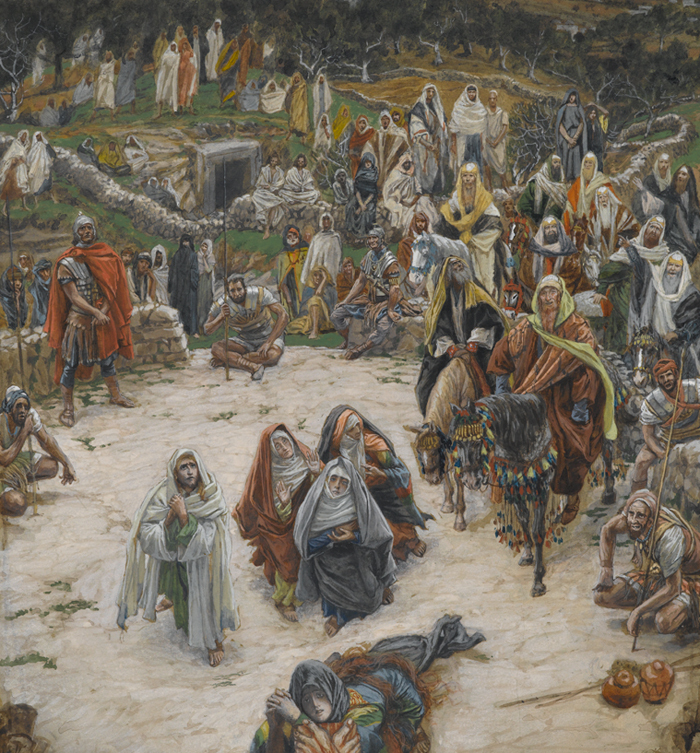 A wonderful artistic discovery for me lately has been the work of James Tissot, whose extensive watercolor series of events in the life of Christ was recently on exhibition at the Brooklyn Museum of Art. 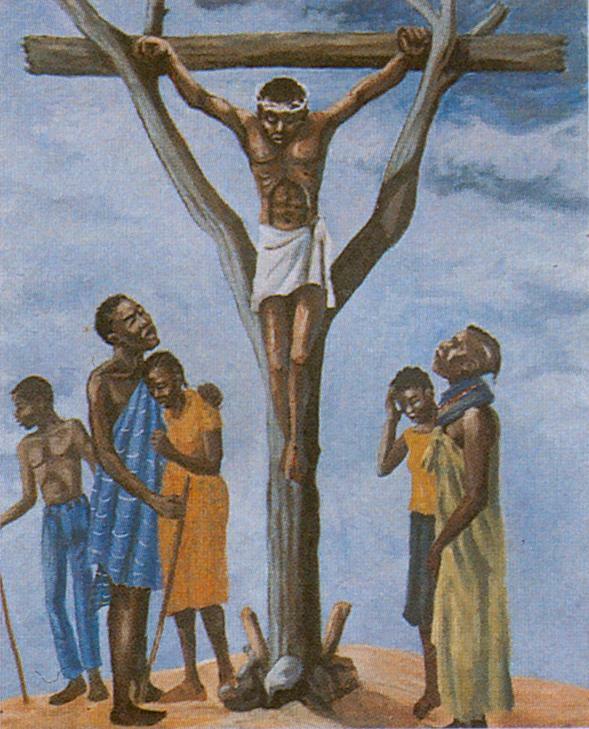 One of Tissot’s best-known paintings is titled “What our Lord saw from the Cross”. It is a small painting, a little over 9” x 9”, and yet a work of enormous scope and power. At the time, it caused a great stir among the art-viewing public for the audacity of imagining such a profound moment from Jesus’ own viewpoint. And this is a “presumption” that many of us may be shy about but need to explore. We say that we believe that Christ is fully human and then may be timid about these realities. It is natural to deify Christ on the Cross – to hold the Passion at such reverent emotional and spiritual distance that we dare not think of what the human person Jesus of Nazareth might have felt. Tissot dares to envision. On the faces of those at the foot of the cross Jesus sees every passion known to humanity. He looks at the people looking up at him. Some are scornful, almost leering; a well-dressed man on horseback gazes up at Christ as someone from whom he has nothing to learn. Christ watches himself being regarded as a zero, a nothing, a person of no significance. The rider’s companion, equally well dressed on another horse behind him, gazes anxiously up at the sky, noticing the gathering clouds that will in a few hours tear the Temple veil in two. Other onlookers are curious, or disgusted, or visibly relieved that this disgrace and suffering is falling on someone other than themselves. The women and the Beloved Disciple are at the foot of the Cross: distraught, resigned, sorrowful. As we look down through Jesus own eyes, we see our own bloodied feet. This, or something like it, must have been what Jesus saw from the Cross. By all accounts, Jesus’ own demeanor does not change. Despite the whirlwind of passions and reactions to him, his reaction towards others remains one of loving concern. His clear gaze has already taken in his persecutors and enemies, his friends who love but are vacillating, and those who are faithful to the end. For me, Jesus’ Passion resonates with more nuance and complexity – more true to human experience – when I dare to imagine Jesus experiencing all these things as a fully human being, vulnerable not only to the physical suffering but also to the pain of betrayal, rejection, fear, abandonment by God and his friends. We honor Jesus most fully when we refuse to deify him at the expense of his full humanity. You are currently browsing the (7th) Seventh Station category at Blog of St. Luke in the Fields.